Federal Donuts' hot fresh donuts. Last month, Philly-grown franchise Federal Donuts went green with a limited edition doughnut in honor of the Philadelphia Eagles. This month, the shop is commemorating a different green-themed celebration: St. Patrick’s Day. In honor of St. Patrick’s Day (you can expect the streets to be packed with college-aged bar crawlers this Saturday, March 17), Federal Donuts is offering a creation inspired by the Irish Potato candies, a seasonal tradition that’s most commonly known in the Philadelphia region. 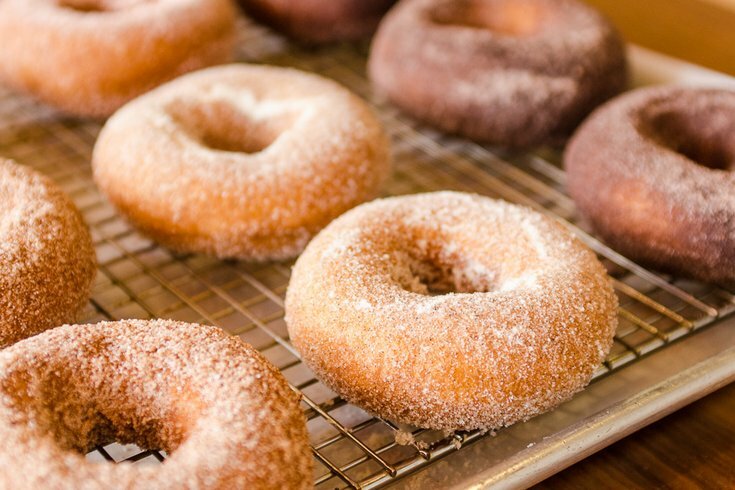 The doughnuts, which offer a cinnamon and cream cheese glaze with sugar, spice, and toasted coconut, will be available at Federal Donut stores throughout the month of March. If you’re somehow unfamiliar, Irish potato candies are neither from Ireland nor contain any potato. The small candies are instead filled with coconut cream and covered with brown sugar, giving off the aesthetic effect of a potato. Oh Ryan's, based in Boothwyn, Pa., claims to be one of the dessert's biggest suppliers. They’re usually a big hit during St. Patrick's Day celebrations across the Philly-area Catholic school circuit. Irish or not, you can try the new confection at one of its Philadelphia locations.